I heard "Ready to start" by Arcade Fire on the radio yesterday for the first time. "How to be alone" by filmmaker Andrea Dorfman and poet/singer/songwriter Tanya Davis is beautiful and perceptive in word, image and tune. After viewing the video many times, I realized that the benefits of being alone are visually implied in the film by Tanya's being in nature, outside or away from screens which constantly and digitally connect us to others. One of my favorite lines is "Start simple: things you may have previously avoided based on your 'Avoid Being Alone Principles.'" What's yours? Seen many places, like here, here and here. Update, September 2, 2010: The Next Web's article "How Andrea Dorfman learned to be alone and earned herself a million views on YouTube" provides some interesting details about how the video came together and how social media contributed to its wide online viewing. Mashups are, according to a Wikipedia entry which needs some editing and discussion around its content, almost a decade old. (Music sampling has existed for decades.) The genre continues to evolve, with stand-outs going viral and their creators/DJs gaining worldwide recognition. "Carpenter's Wonderwall" is one such example: a song/video blend created by DJ Mark Vidler of Go Home Productions. It starts with Oasis's "Wonderwall" and is joined by The Carpenters' "We've Only Just Begun," bridging hits from different musical eras. It's brilliant on so many levels — enjoy. This short video says so much in just over three minutes. Enjoy. With my quarterly writing mixes (seen at right under the category cloud), I went from summer straight to winter—my fall has been busy beyond belief. That's a good thing! I haven't featured a writing-mix music video in a long while, so this blog is due for one. The following is an excellent song, appropriate for any pre-writing dance sessions/rev up or for working on action scenes while writing. Plus, the video heavily features the band Bloc Party performing; I gravitate towards videos which actually feature the bands. My Summer 2007 Writing Mix is up. Make your own! Fireflies in the thousands flicker at twilight. Daylight spreads far past 8PM. Every solution to the heat's physical discomfort results in two words: ice cream! (Or "air conditioning.") Summer surrounds us completely. Behold "Writing Mix — Summer 2007," now available on my blog's right-hand side. As I Twittered last night that I was working on my summer writing mix, paying close attention to 1980s classics, others answered back. General sentiment: songs from the 1980s are some of the most memorable and are still loved today; no following genre has completely outshone these tunes' quality or popularity. As I surfed YouTube, I noticed many comments from self-identified 18-year-olds in which they also professed their love for 80s music; though born in the late 1980s, a few admitted that they prefer (1980s) New Order and Depeche Mode to anything else out today. Do I write to music? Sometimes. It depends on what I'm writing. What I more often use this mix for is the all-important pre-writing inspirational session. When I listen to these songs, I create energy and momentum which I then carry into my writing. If I need a quick break from writing, I'll listen to music to jump-start my brain. The more I write, create, read, think and learn, the more I'm convinced that music helps connect linear and non-linear thinking. Music is an integral part of my writing/creating process. If you don't have you're own writing mix, I suggest you create one. Give it a try, and see how it works for you. Bonus link: Blogmusik is recommended as a good online place to start your own writing mix. Thanks, Chocolate Chipped and Telegraphik! When I first saw this book sealed in a bag of water, I didn't like it because I thought the book would soon disintegrate. The song "Message in a Bottle" by the Police started playing in my head. Perhaps the book was "sending out an S.O.S." to be rescued? Or was this some 21st-century message in a bottle—a tome of desperation-filled emo poems sealed within a (leaking) plastic bag and tossed into the local reservoir? Both are cries for assistance. ...the fantastic new Italian limited commemorative edition of Jules Verne's Twenty Thousand Leagues Under the Sea designed by Paolo Orsacchini. 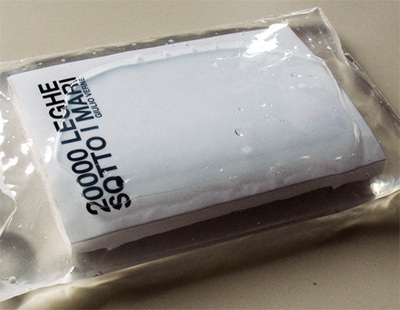 It's printed on waterproof paper and enclosed in a clear pouch filled with real sea water. Collectors can either bust it out of its original packaging, dry it under the sun, and enjoy a classic read, or they can preserve this limited piece in all its designed glory. This packaging creates its own experience beyond the amazing story sealed inside. It's now more art object than literary classic. There's real sea water in there, and I want to know what sea this water is from. Is it polluted? Was it filtered before being sealed around this book? What will happen to the book over time? Even though the paper is waterproof, salt water is incredibly corrosive even to the iron hulls of ships. If you owned this, would you contentedly leave it as is, or would you have to know what the book looked like inside? Book/art object found at Core77.